I am constantly hearing my colleagues criticise Wikipedia, expressing their disbelief that students would use such an "unreliable and innacurate source of information" when preparing an assignment or essay. Up to date? Yes. Relevant? Yes. Accurate? Maybe! But we shouldn't be the ones to tell our students that it's not accurate. If they are independent, information literate learners, then they will be quite capable to make that decision themselves after conducting further research on the topic. And if, after conducting that research, the student finds inaccuracies in Wikipedia, then they should be encouraged to correct the entry. I am not suggesting that Wikipedia should be the primary reference within a written piece of academic work, but it is certainly an ideal starting point for a student when researching a topic. Are you still not convinced? 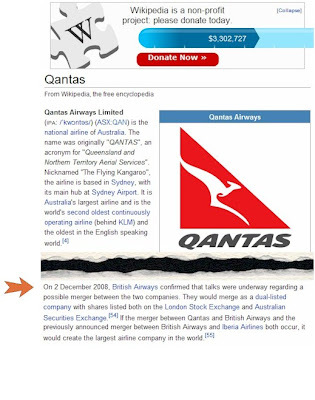 Spend some time investigating the "History" and "Discussion" tabs for any entry, or contribute (or correct an inaccuracy) in Wikipedia yourself. You'll soon begin to appreciate the value of a "crowd-sourced" publication, and how it can contribute to critical thinking and information literacy amongst our students.